AFTER THE EVENTS of July 9 in Kuala Lumpur, Malaysian Prime Minister Najib Abdul Razak could be making a mistake if he calls snap elections any time soon. A day after the police suppression of the Bersih 2.0 demonstration, he continued using a confrontational tone in public and seemed to play more the role of United Malays National Organisation (UMNO) party leader than of Malaysia’s national leader. This strongly suggests that he is psyching himself and his party into election mode. However, no event since the last general election has generated as much outrage as the suppression of the Bersih 2.0 demonstration on Saturday did. After all, the list of demands that the group of non-government organisations (NGOs) wished to hand over to the Malaysian King was but a call for electoral reforms. These issues are racially and religiously neutral and most thinking people would find them at least worth discussing. By letting the police shoot chemical-laced water cannons and aim tear gas canisters into the crowds and apparently at the heads of opposition leaders such as Anwar Ibrahim and Khalid Samad, the government angered many and left even more stunned. It was outrage over how Anwar Ibrahim was treated in 1998 that ignited the Reformasi Movement and led to UMNO losing control over Terengganu state to Parti Islam SeMalaysia the following year. Outrage over police brutality on July 9 and the arrest of 1,677 demonstrators, provides opposition parties with a common experience on which to build a unifying narrative. The manner in which the government handled Bersih 2.0 will help consolidate Pakatan Rakyat in a way little else could have done. Some would say this was the Long March. Bersih 2.0 was given its name partly to secure its connection to the Bersih rally but it was reformed several months ago pointedly without official participation from opposition parties. This was to allow it to develop as a purely civil society initiative. However, opposition activists are bound to support it because the electoral reforms demanded aim to create a more level playing field for democracy; and that is why the government saw red when faced with the prospect of a march by tens of thousands through the streets of Kuala Lumpur. Bersih 2.0’s activities have been largely about raising Malaysian consciousness about democratic processes and rights, voter registration and political engagement. The government’s use of harsh laws, emergency regulations such as the banning of the organisation and yellow T-shirts, and the police muscle before and during the march on Saturday merely served to enhance the NGO’s agenda. Looking back, it is hard not to see that the continuing challenge from Bersih activists could have easily been better managed. If permission had been given for the rally, then the police would have been able to decide the route and to exercise tight control over the event. By announcing that no permit would be given even before it was applied for, the Home Ministry made a street confrontation inevitable. Intimidation through arrests and other means over the preceding two weeks did have some effect and caused Bersih leaders to quickly accept an unexpected offer made by the King. 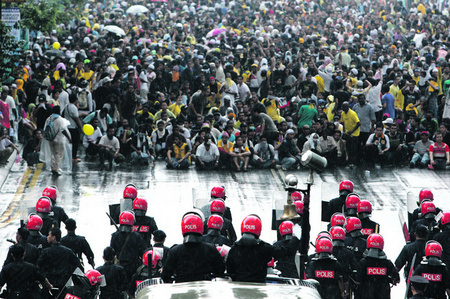 When Bersih agreed to change the march to an assembly within a stadium, it looked as if Mr Najib had pulled off a clever manoeuvre and had forced his opponents to fight on his terms. However, this perception was soon proved incorrect when Home Affairs Minister Hishammuddin Hussein immediately ignored the King’s feat by denying Bersih a stadium. To be sure, in order not to compromise too heavily, Bersih had demanded to use the arena with the most emblematic value – Merdeka Stadium, where the declaration of independence was read out in 1957 by the first Prime Minister Tunku Abdul Rahman. The minister’s strange move threw the point of confrontation back onto the streets, leaving the police with not much choice but to use riot weapons on peaceful demonstrators. The symbolism embedded in Bersih’s wish to hand over the memorandum to the King and not the Prime Minister is quite obvious. It was meant to convey disappointment in the Najib administration and was a desperate appeal to the throne as the alternative national authority, and to past but respected leadership. The question of what price the events of July 9 will extract now lies with the voters. The writer is a Senior Fellow at the Institute of Southeast Asian Studies. His recent books include The Right to Differ: A Biographical Sketch of Lim Kit Siang and In Lieu of Ideology: An Intellectual Biography of Goh Keng Swee.